Stonehenge Campaign | Free the Stones! “Here is a quick summary of the Round Table meeting in Salisbury, held on the 4th March, 2019 to do with the forthcoming Spring Equinox at Stonehenge..
Around 8.09 a.m. on Saturnday 22nd December 2018 the sun will rise at its most southernly as seen from the Stones. 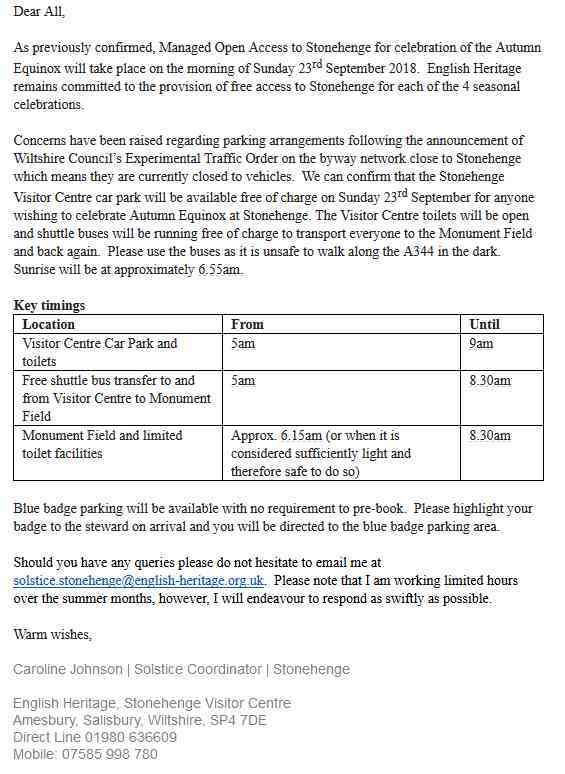 English Heriticage are opening their gates to their carpark and to Stonehenge at 5 a.m. on Sunday 23rd September 2018. Unfortunately the Drove will be closed. Traffic Order -Experimental: closure to vehicles of BOATs on WHS! “Traffic Order -Experimental: closure to vehicles of BOATs on WHS! Well its happening at last, despite warnings and being told we were making it up, here you are now – this comes of using the BOATs as a campsite. We had express warnings, we passed them on they get ignored and those that try to explain get abused. Those of us that fought this from 2009-11 will be interested to see how this plays out, what another waste of so many people’s efforts then! Please find attached to this email a summary of notes and actions from the Round Table Group meeting held on 4 July 2018 in Salisbury. Many thanks to all who contributed in advance or by attending in person. The next Round Table Group meeting is on Wednesday 17th October from 1pm to 3pm at Fisherton Hall, St Paul’s Church, Fisherton Street, Salisbury, SP2 7QW. The ground floor meeting space is within a friendly and accessible venue positioned very close to Salisbury Train Station with excellent parking facilities and dedicated disabled spaces directly outside. Full details are available on the website http://www.stpaulssalisbury.org/content.cfm?id=351. The primary focus of the next meeting will be to discuss Winter Solstice 2018. A draft agenda is attached and a final agenda will be shared with you ahead of the meeting. Please use the online form below to contribute your ideas for the agenda and confirm your attendance. Should you have any queries please do not hesitate to email me at solstice.stonehenge@english-heritage.org.uk. 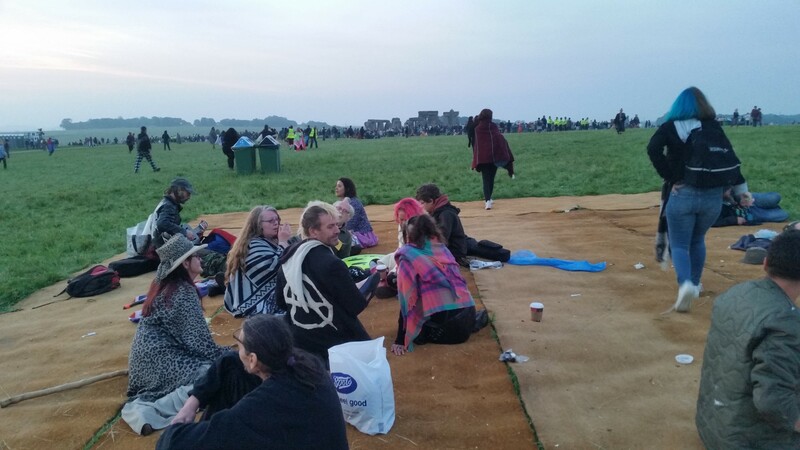 Summer Solstice Sunrise Thursday 21st June – Stonehenge? details on a poster is here. English Heriticage’s carpark opens at 7pm Wednesday 20th June 2018 with a £15 charge per car and a mile walk to the Stones, with disabled buses. However access is free if you walk, cycle or get a bus. and walk the five miles to the Stones. There will be police with guns, and searches. This was an independently facilitated workshop organised by EH to improve communications including deciding on what issues were needed to be debated, getting a Code of Conduct so people were safe to speak without shouting, ensuring RT members could add to the Agenda and that get out in time and not last minute. Also a main issue for debate was more access, at least the eight main ceremonial days not just equinoxes and solstices. Encouraging people to engage who cannot get to meetings via a group to discuss online and perhaps an audio link live with podcast links has been suggested.